Many of us have obstacles to overcome in order to live a better life. But, some have more barriers placed in their path that they must ascend than do others. 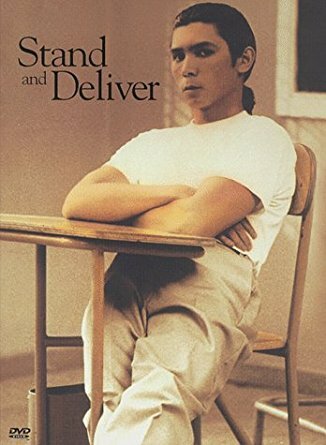 This 1988 film, based on a true story, is one of the most inspirational stories put on film, without being sentimental, that shows the extreme effort needed by some to gain success in the presence of prejudice and the poverty that derives from it. The movie opens with a scene of flowing water which suggests that we may be ready to visit a lush tropical locale. But it is the river that flows through Los Angeles, and it seems ironic to place nature and concrete side by side. But, the water implies that there can be something that is fertile, life-sustaining, even in an asphalt jungle. Right from the beginning we get a symbol that there can be hope here. 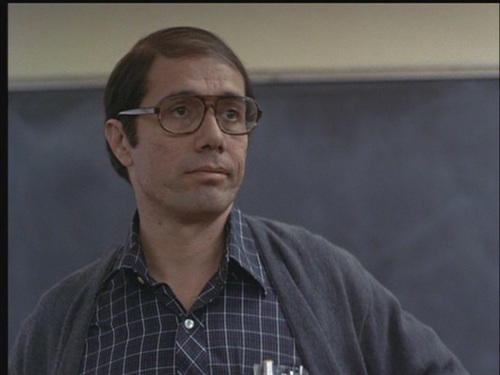 Jaime Escalante (Edward James Olmos, in an Oscar-nominated performance) is heading to the first day of his teaching job at Garfield High School in a Latino section of the city. We are vicariously experiencing the newness of this adventure with him as he takes in the colors, sounds, and diversity of the neighborhood. It doesn’t take long before he encounters his first obstacle. He is supposed to teach computer science, but is told that they do not have computers. The math department chairperson, Raquel Ortega (Virginia Paris) tells him that the computers were supposed to be there already, but it hasn’t happened. It’s like trying to teach carpentry without any tools. So, the bureaucracy already is working against Escalante. 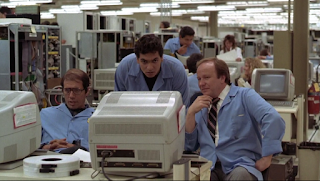 Since he can’t teach computer science, Escalante must switch gears and is assigned to teach mathematics. The next problem is the students. They are unruly, and see no need to learn math. Pancho (Will Gotay) jokingly says, “I don’t need no math. I got a solar calculator with my dozen donuts.” For these young people, the only math they believe they need will be basic calculations done by the machines in fast-food stores. Escalante uses humor to deal with the situation, trying to employ entertainment to get the class’ attention. For example, when a girl drapes herself over the desk of a boy, he says that there is only one body per desk. But there are many disruptions on his first day. There are students in the class who only speak Spanish. The bell goes off right after class begins, since some students have rigged it to sound haphazardly. His car is vandalized on the first day, a window broken and the radio removed. One student wears a jacket with a picture of Jesus on the back. It can either suggest hope, irony that the students feel that God has forsaken them, or a reminder that God helps those that help themselves. He has other effective classroom management techniques. He stands close to a student’s desk, interacting with that person one-on-one, as an individual, not as a member hiding out in a group. This way he can either inhibit bad behavior, or be supportive of positive academic participation. When one student, Lupe (Ingrid Oliu), rebels by refusing to take a test, he separates her from the group, placing her in a chair facing the rest of the class. Instead of his humor and antics providing entertainment, he tells her she is “the show,” and the other classmates ridicule her for being treated like a child in a time-out. Escalante turns the adolescent inclination of making fun of peers as a way to keep students in line. At a math teacher meeting, Principal Molina (Carmen Argenziano) says that if the school doesn’t improve it will be put on probation, and will lose accreditation. Chairperson Ortega points out that there is no real help from the outside in terms of resources. One teacher is supposed to be teaching gym, not math. Another, because of better pay, is going into the aerospace industry. But Ortega’s attitude is a defeatist one, always blaming the situation, those obstacles, for the lack of success, and preaches resignation instead of an attempt to rise to the occasion. She even harbors racist inclinations against her own people, as she suggests that they would have to change the demographics of the district for the school to improve. She surrenders to the notion that they can’t teach “logarithms to seventh grade level kids.” She says that they have done all that they can, but, in contrast to this throwing in the towel attitude, Escalante says he can do more. He counters Ortega’s capitulation by saying, “students will rise to the level of expectation.” If they undercut the students confidence by saying they can’t accomplish goals, they will fail. He tells the students they already have those extra obstacles mentioned above blocking them. In a society that preaches equality but practices prejudice, and assumes they can’t be smart, he says, “You already have two strikes against you: your name and your complexion.” Despite those imposed disadvantages, there is no reason to give up. Knowledge of mathematics will be the “the great equalizer,” leveling the playing field when they must compete for jobs. He wants them to face the reality that an employer does not want, “to hear your problems.” He wants them to understand by working hard, they can still hit a home run despite the “strikes” against them. But, they must have “ganas,” that is, the desire to achieve. 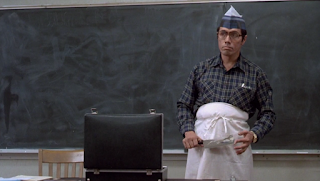 As the students begin to admire Escalante for believing that they can excel in mathematics, they give him the name of “Kemosabe,” which was the term of endearment that the Native American sidekick of the Lone Ranger on the old TV show used for his masked friend. In some interpretations it means “trusted friend.” But, it also has the connotation of someone who has your back when fighting against the enemy, which in this story turns out to be the social system that has placed those “two strikes” against these kids. 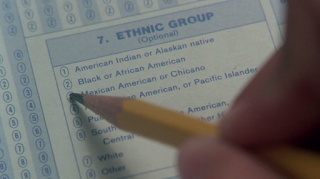 Angel begins to realize that math may be his ticket out of poverty and discrimination. But, he has to avoid the peer pressure of the other gang types who think trying to be a good student is selling out to a system that marginalizes them. 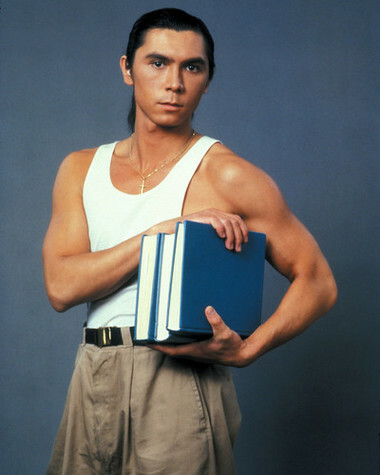 So, Angel asks Escalante for a math book he can keep at home so it appears that he isn’t taking his studies seriously by carrying his book around. His teacher jokingly comments on the the absurdity of the problem when he says to Angel, “Wouldn’t want anyone thinking you’re intelligent, would you?” When he gives him the book, Angel hides it under his shirt. In this crazy upside down situation, it is not illegal drugs or stolen goods that must be hidden, but instead a book is the incriminating evidence. The film takes time to show the obstacles in the personal lives of these students. Lupe is a surrogate mother for her siblings while her mother must work late in order to provide for her family. Angel has a sick grandmother for whom he watches over. 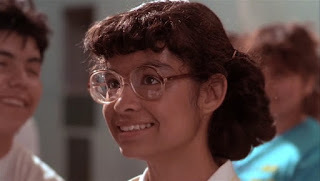 One smart girl, Ana (Vanessa Marquez), tells Escalante that she has to drop out to work in her family restaurant. 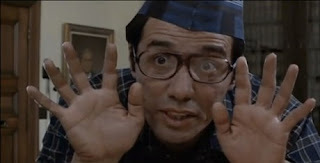 Escalante has dinner at the restaurant with his wife, Fabiola (Rosanna DeSoto), and tries to convince Ana’s father (James Victor) that his daughter can go to college and become a doctor, which is what she told Escalante she wants to be. The father has some old, sexist attitudes about girls, which are impediments to Ana’s wishes. He thinks that the longer Ana stays in school, the more likely she will become pregnant. He says that the whole family works at the restaurant, so why should she be any different. In this way, the father echoes the school math department chairperson by having low expectations for the children, and thus limiting their changes of realizing their dreams. Escalante does go a bit too far by saying that if Ana drops out, she will get fat and waste her life working in the family eatery. This statement is insulting to the father, who had worked his way up from dishwasher to owner. But, Escalante says he, too, started as a dishwasher, and both he and Ana’s father have done well by working hard for what they wanted. Even though the dad is angry at first, Ana shows up at school again, and shines as a student. Pancho tells Escalante that they need to know how math works in the world outside of school. 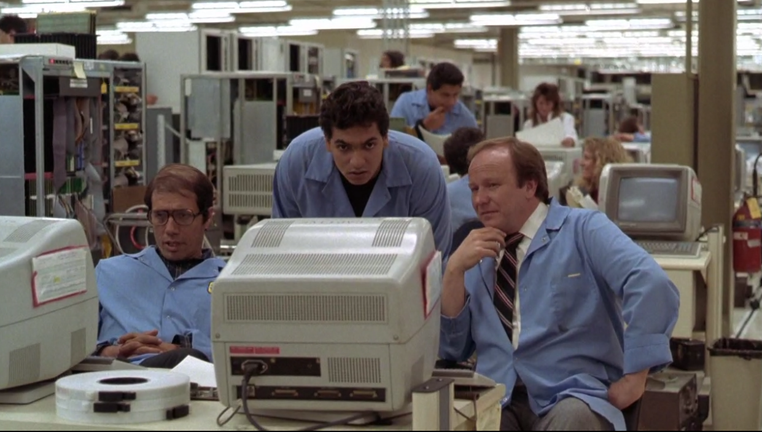 So, the teacher takes them on a field trip to where he worked at a computer company. A student asks what type of mathematics is displayed on a computer screen. He is told that it is calculus, and Escalante says that it will be taught to them when they go to college. The worker there tells Escalante that his daughter is taught calculus in high school. This encounter gives Escalante the idea of teaching his students calculus so that they can get college credit by passing the Advanced Placement test. Of course, the obstacles are there trying to prevent him from achieving this goal. The negative chairperson, Ortega, says that even some math teachers can’t pass that test, let alone their students who have a seventh grade reading level. She says they don’t even have the books. Escalante knows that Principal Molina wants to prevent the school from being put on probation, so the math teacher says the only way to turn the school around is from the top down, with the best students modeling success for the rest of the student body. Escalante says either he gets to teach calculus, or he walks. In order to achieve greatness, for him, there can be no compromises. Ortega tells Escalante that his students will lose what “little” (note the condescension) self-respect they have when they fail. Again, she assumes defeat. For Escalante, giving up without even trying is the greater failure. Principal Molina gives him the green light, but he must teach prerequisites such as trigonometry in the summer to be ready for the calculus in the fall of the students’ senior year. Summer school is usually for remedial courses, but Escalante wants to use it not for going backward but moving forward academically. The students toil in the heat as the air-conditioning doesn’t work, just adding another burden to deal with on their difficult road ahead. Escalante sometimes goes too far in pushing his students. Claudia looks outside of the classroom window, watching other youths enjoying the outdoors while she is inside enduring her teacher’s grueling lessons. She gets up and starts to leave, and Escalante says she probably has another date, and has more boyfriends than Elizabeth Taylor. She angrily tells him before leaving that she doesn’t appreciate him using her personal life for the class’ entertainment. He does run after her, though, and she breaks down, saying that she doesn’t see her boyfriend, hasn’t had time to help her mother, or even to take care of personal grooming. 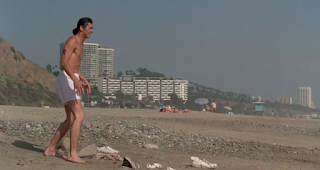 (While rushing to catch up with Claudia, Escalante puts his hand over the left side of his chest. The act is a foreshadowing of what is to happen later). She makes Escalante realize that she is sacrificing a great deal of her young life to study. Angel takes his ailing grandmother to a public clinic where they have to wait a long time because they can’t afford decent health care. 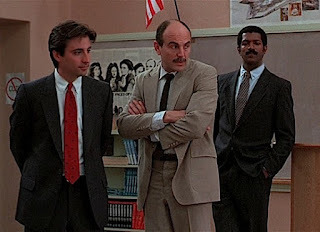 When he is late for class, Escalante kicks him out, and Angel upends a desk, enraged that his teacher won’t even stop to listen to Angels’ reason for his tardiness. Later, Angel crashes Escalante’s holiday dinner, bringing his grandmother, who explains why Angel was late for class. 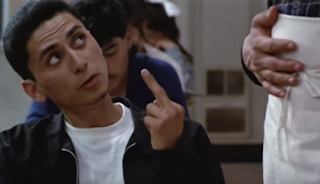 Angel justifies his action by telling his teacher that he needs the math class to get “a good career.” He may have gone over the line, but he has demonstrated to Escalante that Angel has the “ganas” to succeed. But, Escalante’s zeal to accomplish a greater good for many others has shortchanged his own family. Besides putting in so many extra hours teaching calculus, he also volunteers to teach English as a Second Language to immigrants, and recently started helping out at junior high schools. His driven nature catches up to him, because the human body has its own way of becoming an obstacle to unlimited accomplishment. Escalante suffers a heart attack while teaching an ESL class. To emphasize how the students run into roadblocks at every turn, with only two weeks to the AP test, their substitute is a music teacher. Escalante knows how little support and time is left, and he returns to the class after only being sidelined for a couple of days. He so inspires his class that even the struggling Pancho excels, rising to meet what was expected of him. They take the AP test, and after the exam they jump into the ocean together to regain a sense of freedom and relief from the trying ordeal they have endured. But, the water seems to imply a sort of baptism and rebirth, cleansing themselves of their old life and allowing an opportunity to start again freed from previous restrictions. Pancho is working under a car, grease all over his hands and arms when the test results come in the mail, He tries to open the envelope without sullying it with the grime of his labors. He is joyous as he learns that he has passed which will allow him not to suffer under, but instead climb above the weariness of manual labor. At a ceremony at the school, Principal Molina tells the gathering that less than two percent of the students in Southern California attempt the AP test in calculus. However, all eighteen students from Garfield High School who took the test passed. The students feel pride maybe for the first time in their lives and they show their gratitude to Escalante by giving him a plaque expressing their thanks. Their celebrating does last long as the system imposes another obstacle before them. The eighteen who passed the AP test receive notice that they are to be investigated by the Educational Testing Service for possible cheating. On the surface, they are considered suspect because of the uniformity of their answers, so the possibility of copying from each other is raised. Escalante says that the ETS is not taking into account that the students were in one class and taught rigorously as a team by one teacher, which accounts for the uniformity of their test scores. Angel is particularly enraged, but he expresses his anger and despair at being treated unfairly to his friend, while they drive, by using the new knowledge he has learned. He says, “The stars aren’t really there, ese. No, what you’re looking at is where they used to be, man. It takes the light a thousand years to reach the earth. You know, for all we know, they burned out a long time ago, man. God pulled the plug on us. He didn’t tell nobody.” Despite the fact that he is not being recognized for his intelligence and what he has learned, he has enhanced his life because he can comment on it in scientific and religious terms. A police car pulls them over because Angel hangs out of the car and yells at the police as representatives of the system that treats him badly. Angel says to them, “That’s all you know!” It is a simple sentence but it carries meaning. He is pointing out the ignorance of prejudice that assumes a certain ethnic type is worthless, and by making this point, shows his own intelligence. When the police frisk Angel, the only “weapon” he has is a pencil, which negates their assumption that he is dangerous, and points to his immersion in an academic, not criminal, life. Although the tests are initially screened anonymously, once they are flagged, the ETS discovers the names of the students and then can investigate or not. 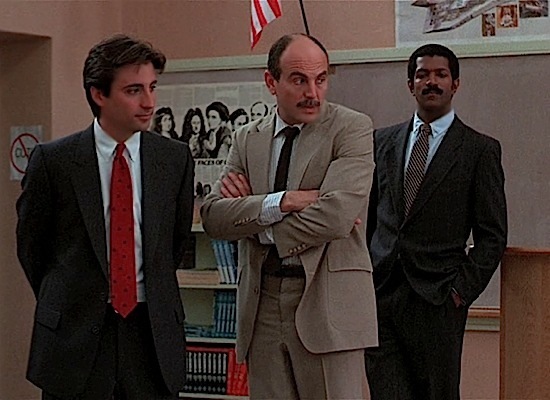 In this case they send an African American, Dr. Pearson (Rif Hutton), and a Latino, Dr. Ramirez (Andy Garcia, in a very early role). It seems that the ETS is going out of its way to appear fair to minorities by having two men who are from oppressed ethnic backgrounds represent them. They gather the students in a classroom and try to make them confess to cheating, as if it is a foregone conclusion. Ramirez is particularly unsavory when he uses his own background to say he understands why they might feel a need to take a shortcut by cheating. His remarks are insulting and demeaning to his own ethnic group. Outraged by the way they are treated, Angel appears to give the men what they want to hear. He says that they have been caught. 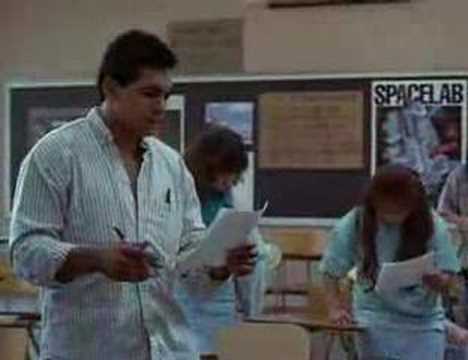 He acquired the test ahead of time from the mailman, who he strangled, and whose body is “decomposing in my locker.” The rest of the class laughs hysterically at how Angel satirized the assumption that they are cheaters and criminals. Escalante refuses to let his kids be stopped on their road to success by the unfairness of prejudice. The students ask for a retest, but they only have one day for review. Escalante says that this time the test will be harder. They must overcompensate in order not to be considered suspect. They can’t have wandering eyes, or wear clothes with pockets. 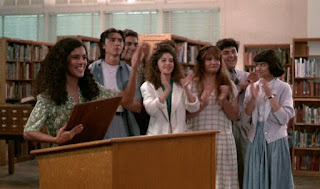 He praises them, trying to build up their confidence, by saying that they are “the true dreamers” (a word which reverberates with immigrants today), and says they are “the champs.” Late in the evening, while some continue to study at Escalante’s house, he takes on a more dire tone. 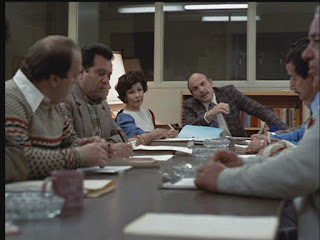 Claudia asks Escalante if he’s worried they will “screw up royally tomorrow.” His response is, “Tomorrow’s another day. 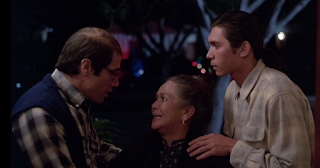 I’m worried you’re gonna screw up the rest of your lives.” He may sound harsh here, but he is trying to tell them the same thing he said to Pancho, which is that the test is only one step on a tough, long journey to realize their full potential. 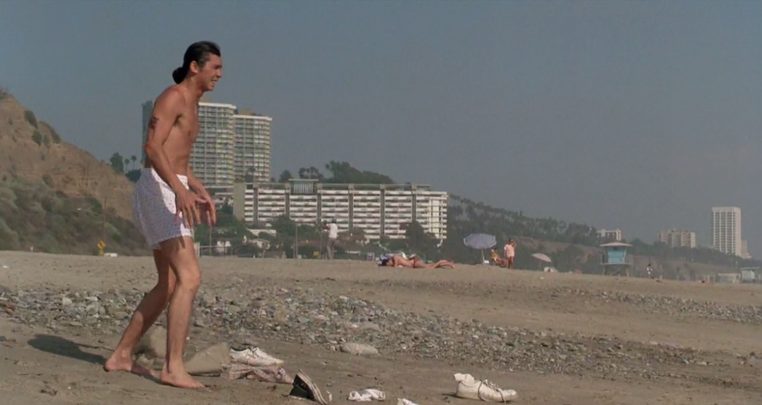 After a week off, the next film is The Swimmer.